Big Latino Turnout In Midterms Raises Stakes For 2020 Latino turnout was up dramatically in the midterms, according to early voting and other preliminary data. Democrats say Latino votes helped flip house and senate races across the country. Door hangers are stacked after a rally with Jacky Rosen, a Democrat who later won her Senate race, at the Culinary Workers Union Hall Local 226 on Nov. 5 in Las Vegas. Organizations like the Culinary Workers Union made a big push to engage Latinos in 2018. In Texas, turnout rose dramatically in heavily Latino precincts across the state — from the Rio Grande Valley, to big cities like El Paso and San Antonio. As she walked into the voting booth in Houston, college student Chelsea Linares said she was thinking about her parents, who immigrated to Texas from El Salvador before she was born. "All the emotions hit," Linares said. "It was very important not only for me, but to be able to give a voice to my dad that can't vote, my mother that can't vote." "They came so my voice could be heard," she said. A record 29 million Latinos were eligible to vote in this year's election, according to the Pew Research Center. We won't know how many did cast ballots until the official tallies are complete. But preliminary data suggests there was a significant jump in Latino participation. 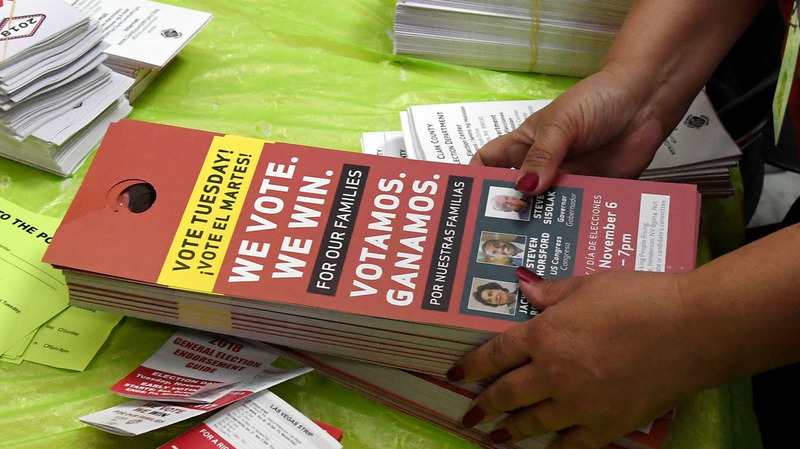 One in 4 Latino voters cast a ballot in a midterm for the first time, according to exit polls. And Latino turnout more than doubled in competitive districts compared with 2014, according to early voting data analyzed by the Democratic Congressional Campaign Committee. "Latinos showed up to the polls because we talked to them," said Rep. Ben Ray Luján of New Mexico, the chairman of the DCCC. Luján says the organization started reaching out to Latino voters more than a year ago and spent more than $21 million on Spanish-language campaign ads and field operations. "We listened to them. Our candidates connected with their personal stories. We knocked on their doors. We reached out online," Luján said. Latinos are a fast-growing demographic that has long been coveted by candidates and strategists in both parties. Democrats think President Trump gave them the edge in this cycle. And there's some evidence to back them up. Three-quarters of Latino voters believe Trump and other Republicans are using "toxic" rhetoric to divide the country, according to a poll conducted by Matt Barreto, professor of political science and Chicana/o studies at the University of California, Los Angeles, and co-founder of the polling firm Latino Decisions. "They were also tired of the discussion of immigrants in such a negative and racist rhetoric," said Barreto, who was hired by the Hillary Clinton campaign in 2015. "This was a very strong mobilizing issue in the Latino community." By focusing heavily on immigration nationally instead of the economy, the GOP missed an opportunity to attract Latino voters, said Daniel Garza. He's president of The Libre Initiative, a conservative nonprofit group that tries to engage Hispanic voters. "I think [Republicans] failed on driving a message that was very positive for them, which was the economy and jobs," said at a panel discussion last week organized by the Aspen Institute and UCLA Latino Policy & Politics Initiative. Still, Garza said that some Republicans candidates have done a good job of reaching out to Latino communities. He pointed to GOP successes — especially in Florida, which has a large Cuban-American population that tends to vote Republican. "That's good for us," Garza said. "That's really good for Latinos to be engaged by both sides. Cause you have to earn our vote like you earn everybody else's." But in most places, exit polls show that Latinos voted overwhelmingly for Democrats. In Texas, 65 percent of Latinos voted for the Democratic Senate candidate. The percentage was slightly higher in Arizona (69 percent) and Nevada (67 percent), two states where Democrats flipped Republican-held Senate seats. Those results suggest that Democrats and their allies are doing a better job of engaging Latino voters. "If candidates want Latinos and Latinas to turn out at the ballot box and vote for them there they will need to make greater and more genuine efforts to court Latino voters," said Janet Murguía, the president of UnidosUS, a non-partisan group that registered tens of thousands of Latinos to vote in the midterms. Candidates and campaigns need to knock on doors in Latino communities, and understand which issues they care about, says Murguía. And there's one state that's the "gold standard" when it comes to Latino engagement: Nevada. With this election, Democrats captured nearly every statewide office. They did it in part by building a ground game that courts Latino voters year round, even when there's no election on the calendar — thanks to the efforts of people like Dora Olivia Arizmendi. "I have to be an example for my community, for my co-workers," said Arizmendi, a housekeeper at Caesar's Palace in Las Vegas. Arizmendi is also a member of the Culinary Workers Union, which is more than half Latino. She took time off from her job to help register fellow union members and get them to the polls. "I was in 110 degrees, knocking doors," Arizmendi said. "And now I can see the differences. I'm proud of that. And I feel happy." In the audio of this story, as in a previous Web version, we say Chelsea Linares' parents immigrated to the U.S. from Honduras. In fact, they came from El Salvador.